With the onset of Spring and now the warm lazy days of Summer, everyone dusts off the BBQ and looks for easy, delicious dishes to accompany the meat ingredients. This recipe has long been one of my favourites and I can’t tell you how many times I’ve been asked for the recipe. I can’t even remember where I got it from or how it came about, but it seems to have become one of my signature dishes. Potato bake needs a bit of preparation and patience as the potatoes are thinly sliced and layered alternately with slices of onion, chopped garlic, sliced mushrooms, salt and freshly ground black pepper and a sprinkling of Onion Soup Powder. If you don’t have a packet of the onion soup powder on hand, you can always substitute with Mushroom soup powder, but I find this sweetens the dish quite a lot and with all the garlic, cheese and cream you do need to be careful not to overdo the richness of the dish. It must be my Irish blood, but I love potatoes and this dish, served with a fresh green salad could even be a main meal all on it’s own, sans meat. Preheat the oven to 180­°C. Wash and peel the potatoes. Slice into thin slices, about 3 – 5 mm thick. Wipe the mushrooms and slice them thinly. Mushrooms absorb water so it’s better to wipe them clean than wash them. Place a flat layer of potatoes along the bottom of the dish. Separate and scatter a few slices of onion over the top. Next, add mushroom slices, followed by a sprinkling of the chopped garlic. Gently shake the onion soup powder packet over the dish, scattering the powder. Don’t add too much, spread it evenly across the layer and next few layers. Add a little salt and freshly ground pepper then begin another layer of potatoes. Repeat points 5 – 10 until all ingredients have been used or the dish is full, ending with a layer of potatoes. Overlap them slightly if need be. Slowly pour over the cream. It should reach at least halfway up the inside of the dish. It is the cream that softens the potatoes as well as combines with the onion soup powder. Cover with the grated cheese and pop into the middle of the oven. 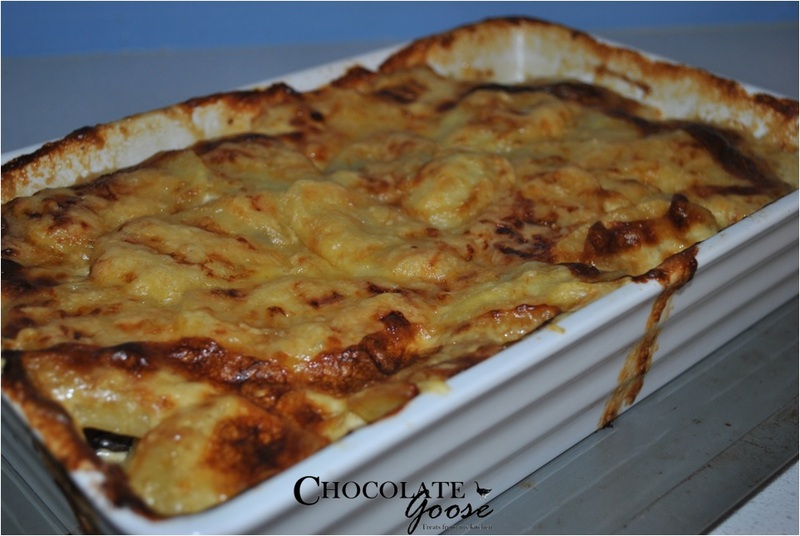 You might want to have it on a baking tray as the cheese and cream have been known to create a little mess.